Enjoy your included, one-night stay at The Brown Hotel in Louisville. The evening is yours to get self-acquainted with this rich in architectural beauty and hidden history. Our Hospitality Desk will be located in the hotel for your convenience between 3:00 PM and 7:00 PM. It is here that our friendly staff can assist with everything from general questions about your upcoming voyage to reserving Premium Shore Excursions. 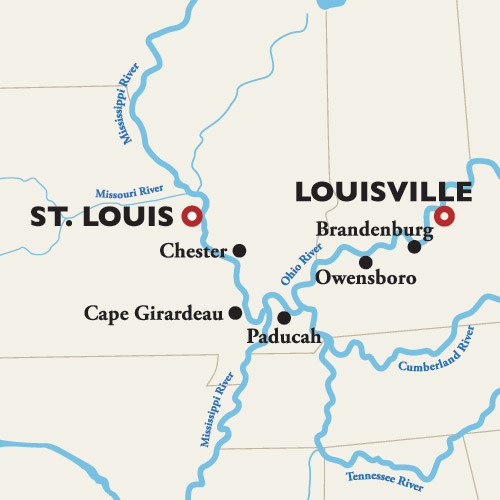 An American Queen Steamboat Company representative, as well as a local representative, will be readily available to provide you with dining, entertainment, and sight-seeing suggestions so that you may maximize your time in Louisville. Enjoy Louisville at your leisure. You will board the American Duchess this afternoon to begin your journey. Join us as we begin a journey through the scenic rolling hills, manicured farm lands, and unique river topography of Brandenburg, Kentucky towards Fort Knox. Upon arrival, our personal motorcoach will come to a halt at the United States Army’s Patton Museum of Cavalry and Armory; a fascinating museum focusing on the inspirational leadership of historic American heroes. The museum’s original intent was to honor and memorialize one of World War II’s greatest war generals, George S. Patton, and has grown through the years to include leaders of all generations. As an expert guide chauffeurs us through each exhibit, enjoy displays of Civil War equipment, weapons, and memorabilia as well as present day army artifacts. Experience a sense of pride in the men and women who has served this country as you hear stories of true heroism and bravery and then trace the life of General Patton as we see a number of his personal effects, dating back to his childhood! Don’t miss out on this exclusive tour highlighting the heroes throughout American history! The first European descdant to settle in Owensboro was frontiersman William Smeathers or Smothers in 1797, from whom the Riverfront park is named. The settlement was originally known as Yellow Banks from the color of the land beside the Ohio River. The Lewis and Clark Expedition wintered at what is today's Owensboro prior to departing on their famous travels. In 1817, Yellow Banks was formally established under the name Owensborough, named after Col. Abraham Owen. In 1893, the spellung of the name was shortened to its current Owensboro. There have been several distillers, mainly of bourbon whiskey, in and around the city of Owensboro. The major distillery still in operation is the Glenmore Distillery Company. Owensboro is home to famous actor Johnny Depp, as he is a member of an old and prodigious Kentucky family. As the only Popeye collectables store and museum in America, this small shop located in Downtown Chester will surely bring back memories of the past as you explore. Walk around the front to see original and rare collectables featuring Popeye, Olive Oyl, Wimpy, Bluto, Swee’Pee, Jeep, and much more. Pick out the perfect unique book, toy, video, postcard, poster, or other memorabilia for someone back home or to keep for yourself. Then head into the back to see some rare and highly sought after Popeye collectables.